During the 1950s and 1960s, Roger Hilton was regarded as a leading exponent of abstract art in Britain, winning the John Moore's prize in 1963 and represented the country at the Venice Biennale in 1964. It was his unique style of blending apparent control with uninhibited spontaneity that projected Hilton onto the international stage, leaving him with a reputation as one of the most innovative and exciting artists of Post-War Britain. Roger Hilton was born on 23rd March 1911 in Northwood, Middlesex. Whilst his father was a general practitioner, his mother had trained as a painter at the Slade School, which Hilton himself studied at between 1929-31 and 1935-36. He lived in Paris for about two years during the thirties, studying under Roger Bissiere at the Academie Ransom. In 1939 he joined the army and was a prisoner of war between 1942 and 1945. After the war he taught art, first in a boys preparatory school, then at Byranston and finally, from 1954-56 at the Central School for Arts & Crafts. Hilton began painting abstracts in 1950, being at first influenced by the Parisian style, but after meeting the Dutch painter, Constant in 1953 and travelling to Amsterdam with him, he was inspired by Mondrian which caused him to simplify his paintings, limiting his palette to the primaries. Some works suggest landscape or figures, but some are amongst the most uncompromisingly abstract paintings of their time executed in Britain. In 1956 Hilton began visiting St Ives and finally settled nearby in St Just in 1965. His mature style dates from that period although his work had already been shown extensively in Europe. In 1961 he returned temporarily to a more figurative style with a series of female nudes. During the last few years of his life he painted gouaches in a brighter range of colour although he was bedridden with a muscular disease. Hilton died on the 23rd February 1975 at his home in St Just. 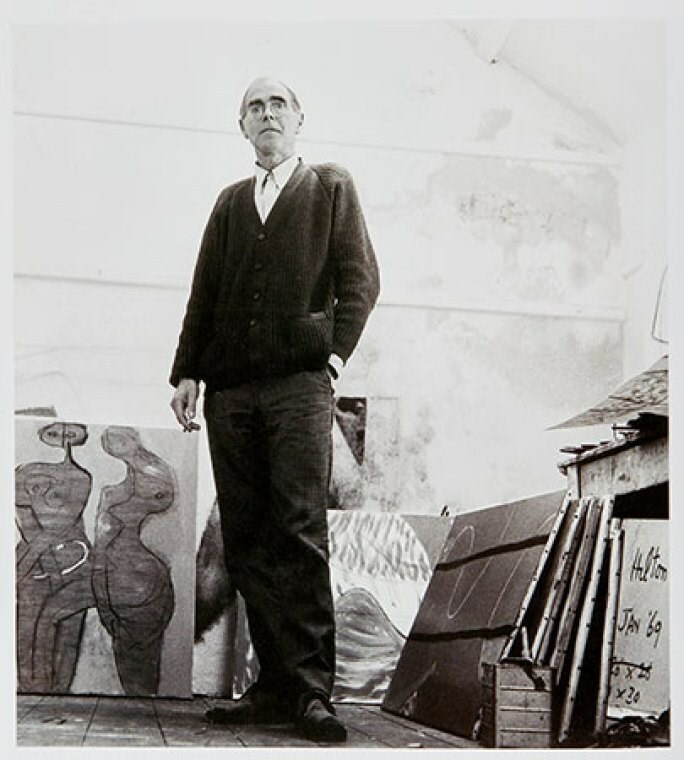 Roger Hilton had won various prizes over the years, including the John Moore's prize in 1959 and 1963, and the UNESCO prize at the Venice Biennale in 1964. Major exhibitions include 'Statements', organised by Alloway at the ICA and a retrospective at the Waddington Gallery in 1983. He was also one of the nine artists included in the anthology 'Nine Abstract Artists'. His works can be found in the permanent collection at the Tate Gallery, London.